Hundreds of Colombian farmers, activists, and community organisers have been killed over the past 18 months, despite the landmark peace deal that supposedly ended 52 years of war. For them, and for local leaders in the former conflict zones, the war – which left an estimated 220,000 dead and seven million displaced over five decades – didn’t end: it only became worse. Those who advocate for leaving behind the illegal coca economy that has long been the rural regions’ mainstay are growing increasingly desperate, as armed groups vie for the bountiful coca-producing areas and trafficking routes once controlled by the Revolutionary Armed Forces of Colombia (FARC), which is disarming under the peace accord. The peace deal itself now hangs in the balance after staunch conservative Iván Duque won the presidency on Sunday. He had campaigned to overhaul terms many Colombians see as too kind to the FARC guerrillas – namely reduced sentences for their leaders and a guaranteed 10 seats in Congress. With the historic signing of a deal to end hostilities two years ago, on 23 June 2016 (the actual accord didn’t pass Congress until November 2016), the conflict was meant to have reached a negotiated conclusion. Instead, more than 100 community leaders and activists were slain nationally in 2017 – a record – and more than 100 have already been killed in 2018, another record, according to Somos Defensores, an organisation monitoring persecution and assassinations in Colombia. Only a fraction of the murders are investigated, and almost two in three occurred in former FARC conflict areas, according to the Office of the United Nations High Commissioner for Human Rights (OHCHR). Diana Sánchez, director of Bogota-based Somos Defensores, said she sees a pattern in the recent bloodshed: of the various social, environmental, and community leaders killed, the majority resided in the coca-growing regions – 68 dead in the first half of 2018. While Colombia is experiencing its lowest overall homicide rate since the 1970s, violence against coca growers in areas formerly under FARC control has gone markedly up. In places where the substitution programme is expected to be implemented, killings have doubled. For leaders like Trochez, the murders hark back to some of the worst periods in Colombia’s conflict in the 1980s and 1990s, when people who lived in areas under FARC influence were often caught in the crossfire between the military, the guerrillas, and state-sanctioned paramilitary groups. The FARC controlled some 170,000 acres of Colombia’s prime coca-growing territory, in a country that produces half the world’s cocaine. Annual profits of anywhere between $500 million and $1 billion have attracted an array of armed actors, including the Popular Liberation Army (EPL) and the Ejercito de Liberación Nacional (ELN), two groups that had not previously operated in Cauca. The indigenous Nasa village of El Ceral has been the site of massacres by paramilitary and military. In El Ceral, all four community leaders have received death threats from armed groups that have emerged since the official end of the conflict. They fear the stage is now set for a repeat of the 1980s and 1990s, as the state, smaller guerrilla groups, criminal gangs (“bandas criminales or BACRIM), and paramilitary successors jockey for control. In her single-room home overlooking hills flushed emerald-green with coca plantations, Trochez, in a strained voice, says she believes she and other officials are being targeted because they support the government’s much-touted but sluggishly implemented plan to substitute other crops for coca. Villages here have depended almost exclusively on coca and coca paste production since the 1990s. Even if they wanted to grow other cash crops, the pitiful state of rural roads, and the difficulty in bringing their produce to market, makes coca the only viable way to make a living. Coca sellers don’t need to go to market – the buyers go directly to the farmer, cash in hand, to buy as much as they can. The substitution programme, a cornerstone of the peace accords, is meant to transition rural populations away from living off coca by replacing the plant with legal crops such as melon, yucca, cacao, or sugar cane. Through a series of multi-year loans, government subsidies, technical assistance, and the creation of market access for affected communities, villages pledged to the plan will gradually shift away from coca. The goal is to build the infrastructure that would allow farmers to bring their new crops to market. But many powerful forces don’t want to see any of this happen. Whole hillsides are covered in coca as planting soars in 2018. You don’t have to move off the main roads connecting the villages through Cauca’s mountains to see coca production in full swing – several multi-hectare plantations, crops recently sown, are in plain sight. Barrios says there has been an 80 percent boom in production locally and blames this on widespread mistrust and confusion over the government’s coca substitution plan. A little over 10 percent of the government’s pledged technical assistance has been released to farmers so far, and fewer than half of the families who signed up for the programme have received their first loans; fewer still their second. The rest of the substitution plan – new roads, land reform, and developing market access – is also lagging behind. IRIN spoke to at least nine farmers who had pledged to substitute but said they hadn’t received any subsidy money and therefore had gone back to farming coca. But the reasons for their changes of heart weren’t purely financial: all but one said they had received death threats. Coca pickers, known locally as raspachines, harvest the coca leaf to sell to processors who render the leaf into a paste in rural laboratories. Coca harvesting has been steadily increasing since the 2016 peace accords between Bogotá and the FARC guerrillas. The message is clear: grow coca or face the consequences. Six pro-substitution coca growers affiliated with COCCAM have been killed in Cauca this year alone; 36 since 2016. 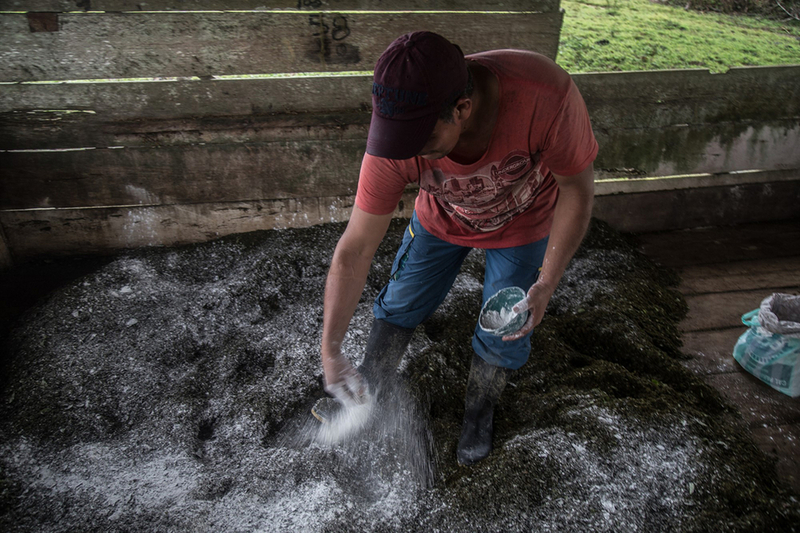 Colombia’s coca output, which hit 900 tonnes last year, is breaking records and flooding European markets, and triggering the first rise in cocaine consumption in over a decade in the United States. This exponential growth in coca cultivation is partly due to a 2015 policy shift made by the Santos’ government, which abandoned a two-decade-old eradication strategy. Aerial glyphosate fumigation was banned for its indiscriminate destruction of both licit and illicit crops, and for the potential health risks it posed to farmers and livestock. As fumigation halted, eradication by hand took its place. By the end of May 2018, 50,000 hectares of coca were supposed to have been destroyed, but so far only 6,831 hectares have been certified by the UN as eradicated. 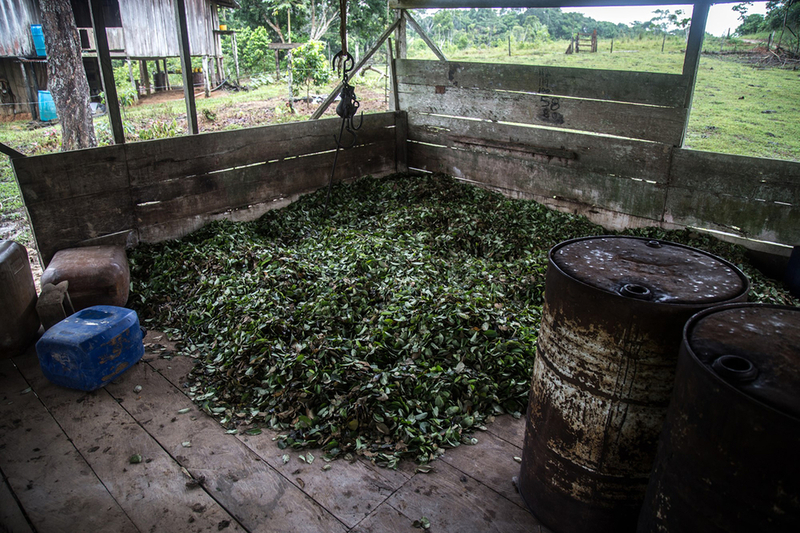 Coca producers render the harvested leaf into a paste to be later crystallised into cocaine. Outgoing President Juan Manuel Santos insists the substitution plan, his brainchild, will succeed. In a recent interview, he focused on the 120,000 families who have signed up to the programme and still cited the 50,000 hectares of coca plantations being eradicated by hand. The government is urging people to be patient and hopes the deployment of 80,000 police officers and soldiers to coca-growing regions in the wake of the FARC’s demobilisation, as well as a separate initiative to protect community leaders in 595 key towns and villages, will yield results. Life in the Cauca department, home to countless afro-Colombian, indigenous Nasa, and mestizo farmer communities, is made difficult by the tough terrain. In the mountain villages of Cauca, where a few years ago there were strong hopes of peace, pessimism is setting in. Gladys Fernandez, a sitting member of the community council in La Esperanza, has scaled down her involvement since getting threats. Others are also growing impatient. “I [take part in the community leadership] for my three kids and five grandkids. But I have to say that I’m very scared,” says Jesus María Gonzalez Salinas, a 57-year-old councillor in the nearby village of La Ventura. Gonzalez struggles to make a living from corn, plantain, and chicken farming. “All I want is for the peace deal to kick in,” he says. “But if the promised money to help victims and coca growers doesn’t come, I just might have to start growing coca again out of necessity.” Most of his fellow growers already have, he adds. The effect Sunday’s election will have on the coca-growing region is unclear. Duque, who, at 41, is Colombia’s youngest-ever president-elect, is expected to take a hard line against the criminal gangs and the guerrillas, but he has also pledged to revisit the peace deal and hinted that he might end substitution and resume aerial fumigation. The last village at the cusp of the Colombian Massif, the source of the mighty Cauca river, is El Porvenir. Rain batters the tin roofs of the coca-growing village while farmers loudly celebrate a local holiday under buzzing light bulbs.